The Trans/Caspian gas pipeline would run under the Caspian Sea from Türkmenbaşy to the Sangachal Terminal, where it would connect with the existing pipeline to Erzurum in Turkey, which in turn would be connected to the Southern Gas Corridor, thus taking natural gas from Turkmenistan to Central Europe. The Trans-Caspian Gas Pipeline (Azerbaijani: Transxəzər boru xətti, Turkmen: Transhazar turbaly geçiriji) is a proposed subsea pipeline between Türkmenbaşy in Turkmenistan, and Baku in Azerbaijan. According to some proposals it will also include a connection between the Tengiz Field in Kazakhstan, and Türkmenbaşy. The Trans-Caspian Gas Pipeline project is purposed to transport natural gas from Turkmenistan and Kazakhstan to European Union member countries, circumventing both Russia and Iran. It is also considered as a natural eastward extension of Southern Gas Corridor. This project attracts significant interest since it will connect vast Turkmen gas resources to major consumer geographies as Turkey and Europe. A project to import natural gas from Turkmenistan through a subsea pipeline was suggested in 1996 by the United States. In February 1999, the Turkmen government entered into an agreement with General Electric and Bechtel Group for a feasibility study on the proposed pipeline. In 1999, while attending the Organisation for Economic Co-operation and Development meeting in Istanbul, Turkey, Georgia, Azerbaijan and Turkmenistan signed a number of agreements concerned with construction of pipelines. However, because of Russian and Iranian opposition to the project, an unresolved legal dispute over Caspian Sea territorial boundaries and a gas discovery on Azerbaijan's Shah Deniz field, the submarine pipeline project was shelved in the summer of 2000 and only the South Caucasus Pipeline project continued. In January 2006, as a result of the Russia-Ukraine gas dispute, interest in the Trans-Caspian Gas Pipeline project was rekindled. On 11 January 2006, Azerbaijan's prime-minister Artur Rasizade proposed to his Kazakhstan counterpart Danial Ahmetov that Kazakhstan gas be exported through the South Caucasus Pipeline to Turkey and from there to the European market. In March 2006, Turkmen President Saparmurat Niyazov signaled his intention to rejoin possible negotiations on the pipeline. In May 2006, during his visit to Kazakhstan, the European Commissioner for Energy Andris Piebalgs professed EU support for the construction of the Trans-Caspian pipeline. Azerbaijan's Industry and Energy Minister Natig Aliyev, while addressing an international energy conference in Baku, outlined the advantages of the Trans-Caspian gas pipeline for diversifying supplies and restraining prices. On the other hand, Russia's Industry and Energy Minister Viktor Khristenko commented that existing technical, legal, environmental and other risks relating to the trans-Caspian project are so great that it would be impossible to find an investor unless there is political backing for the project. On 12 May 2007, an agreement was signed between Russia, Kazakhstan and Turkmenistan providing for Central Asian gas to be exported to Europe through the reconstructed and expanded western branch of the Central Asia-Center gas pipeline system. This was seen as a setback for the realization of the Trans-Caspian Pipeline although Turkmen President Gurbanguly Berdimuhamedow said that the Trans-Caspian pipeline project was not canceled. On 4 September 2008, Iran's deputy foreign minister Mehti Safari confirmed that Tehran opposes the construction of any undersea pipelines in the Caspian because of environmental concerns. This jeopardizes the Trans-Caspian Gas pipeline project, according to regional expert Paul Goble. However, on 22 December 2008 Austria's OMV and Germany's RWE, both partners in Nabucco Gas Pipeline International GmbH, announced they were setting up a joint venture named the Caspian Energy Company, to carry out exploration for a gas pipeline across the Caspian Sea that would feed into the Nabucco pipeline. Based on exploration outcomes the company plans to build and operate a gas transport system across the Caspian Sea. 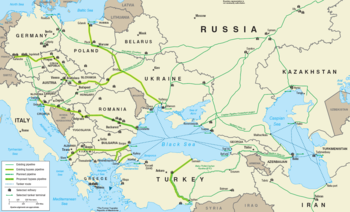 On 12 September 2011, the EU Foreign Affairs Council agreed to give a negotiating mandate to the European Commission for negotiations with Azerbaijan and Turkmenistan on the Trans-Caspian Gas Pipeline. On 3 September 2012, after the meeting between the European Commissioner for Energy Günther Oettinger, Turkish Energy Minister Taner Yıldız, and Azerbaijani and Turkmenistani officials in Ashgabat, Yıldız stated that Turkey will buy gas from Turkmenistan through the Trans-Caspian Gas Pipeline. An EU proposal generally named the Southern Gas Corridor project kindled interest in the Trans+Caspian pipeline as an alternative supply route to Gasprom monopoly to European Union markets. Turkmen gas would be carried along with Azeri gas from the Shah Deniz Gas Field by this pipeline. The projected capacity of the pipeline is 30 billion cubic metres (1.1 trillion cubic feet) of natural gas per year at an estimated cost of US$5 billion. In Baku, it would link to the South Caucasus Pipeline (Baku-Tbilisi-Erzurum pipeline), and through this with the planned Trans-Anatolian gas pipeline. A feasibility study for the project funded by the United States Trade and Development Agency is carried out by Granherne, a subsidiary of KBR. The project is heavily criticized by Russia and Iran, current transit countries for Turkmen gas. Alexander Golovin, special envoy on Caspian issues, has stated that a major gas pipeline would pose a serious, dangerous risk to the prosperity of the entire region. According to the Russian Natural Resources Ministry, any gas or oil pipelines across the floor of the Caspian Sea would be environmentally unacceptable. Russia has also taken the legal position that a potential pipeline project, regardless of the route it takes on the seabed, would require the consent of all five Caspian littoral states in order to proceed. Iran has pointed out that treaties signed by Iran and the Soviet Union in 1921 and 1940 are still in force and that any action taken without the consent of all the littoral states would be illegal. In regard of the decision taken by the EU on 12 September 2011, Russia expressed its "disappointment" as it "seems to have been adopted without taking into account the internationally accepted legal and geopolitical situation in the Caspian basin," and as Caspian Sea littoral state, Russia could veto any international agreement allowing for the pipeline to be built. In reaction to the 1999 plans for a Trans-Caspian gas pipeline Russia and Iran collaborated in calling for a Central Asian gas cartel in 2001 and 2002. There is also a concern in the West that closer collaboration between Georgia and Azerbaijan will isolate Armenia and tempt it to strengthen ties with Russia and Iran. ^ Yenikeyeff, Shamil (November 2008). "Kazakhstan's Gas: Export Markets and Export Routes" (PDF). Oxford Institute for Energy Studies. Retrieved 2008-11-12. ^ "Energy nexus: Russia and Central Asia". RIA Novosti. 2007-05-14. Retrieved 2007-05-20. ^ "PSG International Secures Lead Role in US$2.5 Billion TransCaspian Pipeline Project". Bechtel. 1999-02-19. Archived from the original on 2007-08-18. Retrieved 2007-05-20. ^ a b Miriam Lanskoy (November–December 1999). "Can the OSCE Cope with the Caucasus?". Institute for the Study of Conflict, Ideology, and Policy. Retrieved 2007-05-20. ^ "Transcaspian gas pipeline accord signed". RFE/RL. 1999-11-19. Retrieved 2007-05-20. ^ "End of Russian Monopoly in Energy?!". The Journal of Turkish Weekly. 2007-05-02. Retrieved 2007-05-20. ^ a b Socor, Vladimir (2006-01-24). "Interest Rebounds in Trans-Caspian Pipeline for Turkmen Gas". Eurasia Daily Monitor. The Jamestown Foundation. Retrieved 2007-05-20. ^ Ilham Shaban (May–June 2006). "The US Government Commences Lobbying Trans Caspian Pipeline Of This Project". Azerbaijan Today. Retrieved 2007-05-20. ^ "EU approves giant Transcaspian pipeline project" (PDF). BBN Newsletter. 2006-05-08. Archived from the original (PDF) on 2007-09-29. Retrieved 2007-05-20. ^ a b Socor, Vladimir (2006-03-30). "Azerbaijan Spearheading Initiative on Trans-Caspian Gas Pipeline". Eurasia Daily Monitor. The Jamestown Foundation. Retrieved 2007-05-20. ^ "Putin Triumphant in Turkmen Gas Deal". St. Petersburg Times (Russia). 2007-05-15. Retrieved 2007-05-19. ^ "Putin deal torpedoes Trans-Caspian gas pipeline plans". New Europe. 2007-05-17. Archived from the original on 2007-09-27. Retrieved 2007-05-19. ^ "Russia, Turkmenistan, Kazakhstan agree landmark gas pipeline deal". Forbes. 2007-05-13. Archived from the original on 2008-02-20. Retrieved 2007-05-19. ^ "Иран против прокладки трубопроводов по дну Каспия" (in Russian). OILRU.COM. 2008-09-04. Retrieved 2008-09-06. ^ Paul Goble (2008-09-05). "Moscow Wins a Major Victory on Pipelines". Window On Eurasia. Retrieved 2008-09-06. ^ "OMV, RWE Launch Caspian Pipeline JV". Downstream Today. 2008-12-22. Retrieved 2008-12-25. ^ Vogel, Toby (2011-09-15). "Politics dog EU's quest for gas". European Voice. Retrieved 2011-09-15. ^ Chaffin, Joshua (2011-09-11). "EU set to act on Caspian pipeline plan". Financial Times. Retrieved 2011-09-15. ^ Dunmore, Charlie (2011-09-12). "EU opens talks on Caspian gas pipeline - Commission". Reuters. Retrieved 2011-09-15. ^ Socor, Vladimir (2012-09-11). "Turkey Sees Opportunity in Trans-Caspian Gas Pipeline Project". Eurasia Daily Monitor. 9 (164). Jamestown Foundation. Retrieved 2012-09-12. ^ "TAP Awards Onshore Construction Contracts for Albanian and Greek Pipeline Sections". 4 March 2016. Retrieved 23 March 2016. ^ "Trans-caspian gas pipeline project: Azerbaijan might transit Kazakhstan gas to Georgia". CAUCAZ.COM. 2006-04-23. Retrieved 2007-05-20. ^ "KBR To Study Feasibility of Trans Caspian Pipeline". Downstream Today. 2008-04-14. Retrieved 2008-04-19. ^ a b Blagov, Sergei (2006-03-28). "Russia Tries To Scuttle Proposed Trans-Caspian Pipeline". EurasiaNet. Retrieved 2007-05-20. ^ "Russia says pipelines across Caspian Sea floor unacceptable". RIA Novosti. 2007-01-25. Retrieved 2008-06-01. ^ "Iran warns against trans-Caspian pipeline". Asia Times. 1999-02-24. Retrieved 2007-05-20. ^ Pop, Valentina (2011-09-14). "Russia frets over EU plans to link up Caspian gas fields". EU Observer. Retrieved 2011-09-15. ^ de Carbonnel, Alissa (2011-09-13). "Russia calls on EU to halt talks on Caspian gas pipeline". Reuters. Retrieved 2011-09-15. ^ Blank, Stephen (2007-05-15). "Russia Takes a Step Towards the Formation of a Natural Gas Cartel". EurasiaNet. Retrieved 2007-05-22. This page was last edited on 18 November 2018, at 04:19 (UTC).